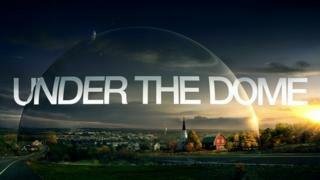 New mystery US TV show Under The Dome is set to premiere on Channel 5 on Monday. Based on the novel by Stephen King, the cast talk about the challenges of bringing it to the screen - especially when changes were necessary to make it work for television. Stephen King first had the idea to write his sci-fi novel Under The Dome in the 1970s. Telling the story of a small town suddenly cut off from the outside world by a giant invisible dome, it was eventually published in 2009 after two previously failed attempts to finish it. Its success led Steven Spielberg's Dreamworks Television to swiftly announce it was developing it for TV and the series has now hit the small screen. Originally planned as a 13-episode miniseries, the show has scored hit ratings in the US during a summer period usually reserved for repeats of old programming. Now US network CBS has announced it has commissioned a second series - the first episode of which, King will write himself. "It's very exciting - it completely sets the tone for what the second season is going to be," says Mike Vogel, who plays army veteran Dale "Barbie" Barbara in the show. The former solider finds himself trapped after visiting the town on a seemingly mysterious and brutal mission. There, he is forced to fit in with the locals as they try to figure out where the dome has come from and why, and cope with the chaos that ensues. The premise is the same as King's original plot but changes were necessary to make it work for television - for example, where events in the book span just six days, the show is forced to continue over a longer period to last its 13 episodes. Despite King being an executive producer and heavily involved in the creative side of the show, it has still incurred the wrath of the book's purist fans for not remaining faithful to the entire story. To address the issue, the author wrote a letter to fans assuring them of his approval. "If you loved the book when you first read it, it's still there for your perusal. But that doesn't mean the TV series is bad, because it's not. In fact, it's very good. And, if you look closely, you'll see that most of my characters are still there," he wrote. "Many of the changes wrought by Brian K Vaughan and his team of writers have been of necessity, and I approved of them wholeheartedly. If you're of a sci-fi bent, think of them as alternate versions of the same reality." Even the stars of the drama admit they initially had their own reservations about the re-working. "We all had questions about the changes we were making," says Rachelle Lefevre, who stars as investigative journalist Julia Shumway. "But we heard from Stephen himself he'd always had this feeling that he was dissatisfied at the end of the book and it would have been interesting to see what would have happened to these characters if they had all lived for longer in this situation. "So he told Brian 'don't feel like you have to wrap it - let's continue this and see where these characters go'." For newcomers to the story, the show has been received well by the audience and critics alike. "I'd like to think it's because we're making a decent show people want to watch," Vogel says. "We're giving them a high concept series with a lot of fantastic effects that only used to be reserved for big budget movies. "And it's hitting on a subject matter people are responding to right now with the current global instability. Everyone asks themselves what would they do in circumstances like that." Lefevre agrees: "I think we have a deep desire as human beings to test ourselves - we want to know what we're made of and to find that out you have to be in dire circumstances that require self-sacrifice or heroics. "When you describe the show it sounds very sci-fi: it's a mysterious dome that doesn't appear to be of human origin. But the themes it deals with are very human - like what do people do in a crisis?" Another factor contributing to the show's success is its business model. CBS struck a deal with Amazon four months before the series even aired, making it available online within days of it being broadcast on the network. Coupled with international sales, the show - which reportedly costs $3.5m (£2.2m) an episode to make - was in profit from the very beginning. And with ratings from live TV and on demand combined at 20 million viewers an episode, other networks are sitting up and taking note. "CBS took a gamble on this," says Vogel. "What cable TV has shown us is that people will tune in for good content whenever they want to watch it - summer included." With the series originally intended to be a self-contained one-off, a second series will force the residents of Chester's Mill to be stuck under the dome for longer than planned. However it gives writers the opportunity to throw new characters into the mix as there is a whole town's worth to choose from. "The way our season ends, there's a lot of mysteries that need to be solved," Lefevre says. "The gift of TV is you can explore something for a long time and the curse of TV is that you have to keep coming up with new ideas. "Sometimes ideas can suffer because they only have a certain amount of human real estate, but Chester's Mill is a huge town." With Vogel revealing bosses have a "multi-year plan" in mind, he suggests the secret to the show's longevity could be in its shorter 13 episode run, rather than the standard 22 episode series on US network television. "You don't burn out the writers or the audience and it gives the creative team a lot more freedom to sit and develop the storylines without having to churn out product," he says. Lefevre agrees: "Because the writers already know what the dome is, they're not making it up as they go along. "They can decide very specifically what they're going to give you each season so they don't have to add filler - and that makes for better storytelling, especially when you're dealing with an over-arching mystery." But realistically, how long could the show go on for? Will an audience soon grow tired of watching a town trapped under a dome with no way out? "The only way to know that will be if we stop writing storylines that capture their attention," Vogel says. "How long can you watch a show happening in a hospital? Yet ER went on for over a decade." "I think it could go for a long time," adds Lefevre. "I don't think it could go forever, but you could get multiple seasons out of it because the dome isn't going anywhere and no one really has any answers. "Our show is like the birth of new civilisation, dealing with what happens if the law and all the parameters that hold civilisation together are no more. "That is the story you can tell for multiple seasons." Under the Dome is on Channel 5 on Mondays at 22:00 BST.